The scenario is fictitious at present but could become reality in a few years time thanks to the efforts of the research scientists involved in the EU project 3Plast, which stands for "Printable pyroelectrical and piezoelectrical large area sensor technology". The sensor recognizes the finger’s heat signal without being touched. 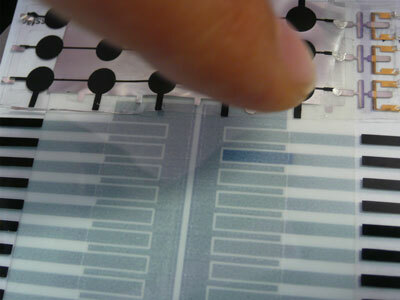 The companies and institutes involved from industry and research have set themselves the goal of mass producing pressure and temperature sensors which can be cheaply printed onto plastic film and flexibly affixed to a wide range of everyday objects, such as electronic equipment. The 2.2 million euro funded project is coordinated by the Fraunhofer Institute for Silicate Research ISC in Würzburg. "The sensor consists of pyroelectrical and piezoelectrical polymers which can now be processed in high volumes by screen printing, for example. The sensor is combined with an organic transistor, which strengthens the sensor signal. It’s strongest where the finger is," explains Gerhard Domann, who is in charge of the project. "The special thing about our sensor is that the transistor can also be printed." "By providing everyday objects with information about their environment – for example whether a person is approaching – by means of pressure and temperature sensors, we can create and market new devices that can be controlled just by pointing a finger," enthuses Domann. The research scientist envisions further applications for the technology in the automotive and construction industries as well as in robotics. "The project comes to an end in January 2011, but we think it will take a few more years before sensors can be printed on large surfaces."